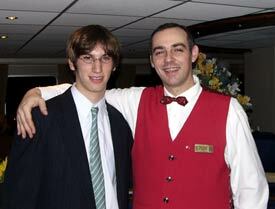 ABOVE: Anders Imboden poses with waiter Eduardo Fernandes in MS Maribelle's dining room. Food is an important part of any cruise--and on a voyage that meanders through the heart of France's leading gastronomic and wine regions, dining takes on even more importance. We had our first encounter with the MS Maribelle's food after boarding the ship in Chalon-sur-Saône. It was mid-afternoon, and we were pleasantly surprised to find a table with freshly-made baguette sandwiches and drinks in the Lounge. The sandwiches were wonderful, and they helped to give us the energy we needed to wander around the town until dinner. Dinner on MS Maribelle is a leisurely four- or five-course meal that usually consists of a salad or appetizer, soup, an entrée, dessert, and--for those who have room--a plate of after-dinner cheeses. On most evenings, guests had two choices for each course, and those who craved for simple food could always order a steak or chicken breast instead of the night's entrées. Lunch is similar to dinner, but with fewer courses, and guests can choose sandwiches from a buffet if they don't want a hot entrée. Shore excursions return in time for the 12:30 meal hour, and afternoon cruising usually begins as passengers are sitting down to lunch in the large-windowed dining room. Other meals include afternoon tea and a "midnight snack" at 11 p.m. There's no room service, but with the ship being moored in cities or towns for much of the trip, anyone who's hungry for a snack at odd hours can easily step off the ship and find a café or pastry shop. Florian Brajkovik, the maitre d', ran the service operation with warmth and savoir-faire; and Daniele, our bar waitress, was always quick to supply the table with drinks, ice water, and fresh bread. The MS Maribelle has a bar in the lounge, where you can get all the usual drinks plus alcoholic and non-alcoholic "cocktail of the day." Drink prices are comparable to what you'd pay in a local bar or café. Hot coffee and tea are available at no cost throughout the day. 2014 update: Viking's fares now include house wines, beer, and soft drinks at lunch and dinner. (Hot or iced tea and coffee are also included.) Premium wines and beers are available, or you can buy wines locally and enjoy them at meals without paying a corkage fee.